DC’s latest Justice League series run began on July 20 and is being scripted by Bryan Hitch (The Ultimates). The Extinction Machine opened up with massive earthquakes shaking earth’s cities to their foundations. 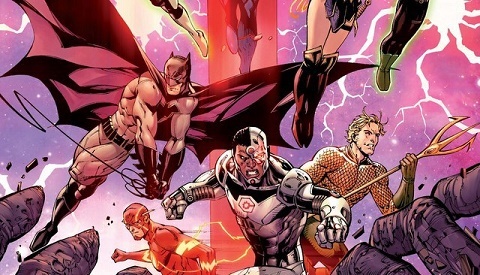 It transpired that an ancient intelligence had arisen with dastardly designs on the planet, thus the Justice League (as imagined in the Rebirth universe) has assembled to protect all humans from the malevolent presence. Called the Awakened and possessing what appeared to be a hive-mind entities, this mysterious ancient evil regards the Justice League as their enemy. Batman realizes this immense, game-changing crises cannot be resolved merely by himself and calls on Superman for help. In The Extinction Machine episode #3, the Awakened (we learn that they refer to themselves the Kindrid) began transforming into giant monsters, constructed it is revealed from literally hundreds of ordinary humans. The Kindrid are also imitating or somehow manifesting the super powers of the members of the Justice League. In Issue #3, Superman travels to the center of the Earth and discovers three doomsday machines, the source of the earthquakes, that could theoretically destroy the entire planet. Meanwhile, the Green Lanterns and the Flash are utilizing every trick in their arsenals to defend the earthlings from the devastating effects caused by the Kindrid, and Aquaman is battling a Kindrid in his Atlantis home. Confused? Initially the actions of the Awakened are hidden from the readers setting up later cliffhangers and large scale sequences, but we discover more about the antagonists’s secretive motivations as the season progresses. This series has definitely returned to the more classic oriented action and adventure driven narratives. Batman and Superman are back to the mode of saving the world from devious alien creatures and elaborately scheming super villains. Writer Bryan Hitch is certainly an excellent story teller and displays his obvious passion for many of the Justice League characters. Artist Tony Daniel has created some striking images, bringing to life both the powerful action sequences and the complex facial expressions and demeanours in the more emotionally driven scenes. There are some visually arresting backdrops that set the atmosphere for the narrative and dialogue. Those who appreciate a good Justice League comic will enjoy this season. Pretty sure that comic readers who have already completed the first three episodes will be tuning in to find out what happens next in Issue #4. The Extinction Machine episode #4 will be published on September 7th.